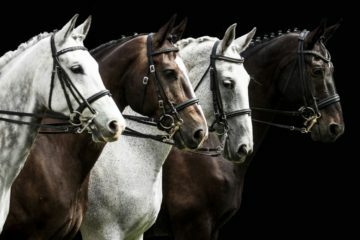 One of the best things for dressage horses is variety. 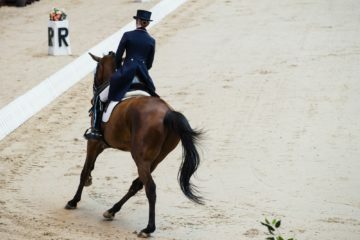 Dressage is a tough sport, which requires patience, persistence, and A LOT of time. It is extremely repetitive and requires practicing movements and parts of movements over and over again. This is not only physically taxing on our horses, but it is also a mental challenge. 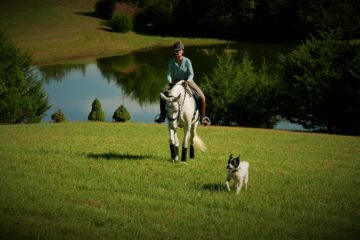 Similar to people, all horses are different and have a variety of learning styles. Each horse is an individual and requires his or her own unique approach to learning. We can often achieve great results by changing the way we train various movements. Sometimes, just asking the question in a different way can help a horse understand, help them find their balance, and encourage relaxation. Canter pirouettes are a movement introduced at fourth level, and then the half pirouette is a judged movement at the Prix St Georges. This requires the horse to collect the canter, transfer more of their weight onto their hind end, and lift their shoulders. It’s a difficult posture for the horses and requires a great deal of strength and balance. An excellent way to begin introducing canter pirouettes is out in the field! 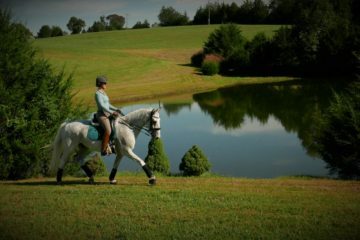 Begin by collecting the canter for three to five strides on a circle. 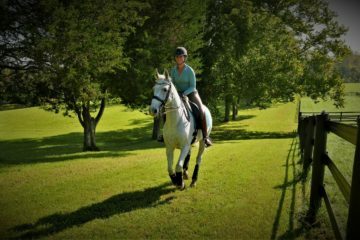 Encourage your horse to hold the collection, and then release the canter slightly. Do not worry if the horse breaks to trot. Take your time and find the canter again, then go back to asking for some strides of slower, more collected canter. As usual, if there is a slight incline or decline in the field—even better! It will make riding these movements in the ring feel even easier. Next, start spiraling your circle in: go from 20 meters to 18, to 16, to 10, to 5, and hold—this is so hard! Again, if your horse breaks in the canter, do not fret; take your time, find a nice canter, and begin again. Challenge yourself to do this on slight inclines and declines in the field (if you have them). Once you have spiraled into a 4 to 5ish-meter circle, slowly make your way back out onto a 20-meter circle. Try spiraling out 1 meter at a time and allow it to take an eternity. Remember to stay loose in your hips, move your elbows, and offer lots of praise to your horse! This is hard, and compressing the canter slowly is a challenging task. Don’t forget to take plenty of walk breaks, praise, and even let them grab a bite of grass if needed. And, most importantly: Have fun!